We recently took a look at how Russell Wilson was the king of the fourth quarter last season, and it got us thinking – who were the top NFL quarterbacks in the other three quarters, on a grade-per-dropback basis? Was their a consensus top quarterback across the board, or do we have mixed results? To look at this, we took every passing play a quarterback had last season, sorted by quarter and utilized our +/- grades on a per-dropback basis to take a look at who the best quarterbacks were per quarter. To qualify for rankings, each quarterback needed to take at least 50 dropbacks per quarter, which in turn would project to at least 200 dropbacks per player. Mitchell Trubisky takes the crown on this one, leading the league’s quarterbacks in PFF grade per dropback in the game’s opening stanza. He unleashed a big-time throw percentage of 7.60 percent in the first quarter, the third-highest percentage among his peers. He may have only recorded a passer rating of just 100.3, but he was incredibly accurate in the first quarter, compiling an adjusted completion percentage of 84.7, the highest in the NFL last season, by 3.0 whole points. In a story only we at PFF can tell, his lone interception in the first quarter came via a non-turnover-worthy throw, as he was difficult to defend against both when kept clean in the pocket (107.0 passer rating, 11th) and when the defense sent extra pass-rushers (127.4, first). Not shockingly, Matt Ryan and Tom Brady find themselves at second and third, respectively, in first-quarter grading per dropback as Ryan led the league’s quarterbacks by not throwing a single turnover-worthy pass in the first frame. Brady led the league with 10 big-time throws in the first quarter against only two turnover-worthy throws. Jimmy Garoppolo leads the league’s quarterbacks in second quarter grades per dropback, by a large margin as much like Trubisky in the first, Jimmy G finds himself at or near the top of several second quarter passing statistics. In our adjusted passer rating figure, developed by our PFF Forecast team that essentially replaces interceptions with turnover-worthy throws and touchdowns with big-time throws, Garoppolo sported a 104.4 mark, tying for the third-highest in the second quarter. He was subject to two interceptions in the second quarter, both of which were not deemed to be turnover-worth plays, proving just how valuable a switch in the standard passer rating mark can be to understand quarterback play. He saw an adjusted completion percentage of 72.2 percent and was solid both against the blitz (112.1 passer rating, eighth) and when kept clean from the pocket (110.0, 13th), again, much like Trubisky in the first. 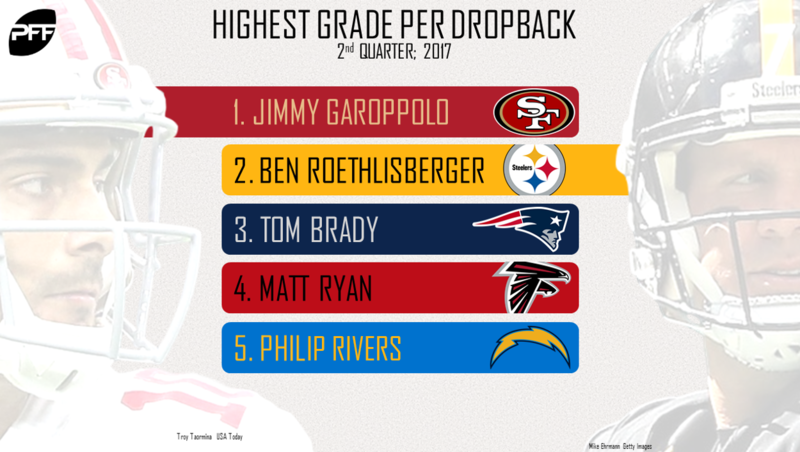 Once again, Brady and Ryan find themselves in the top five, finishing third and fourth, respectively, in grades per dropback in the second quarter. Brady once again unleashed a high amount of big-time throws (13) but was outpaced in the second quarterback by Ben Roethlisberger, who threw 15 big-time throws, compared to just three turnover-worthy throws. Big Ben attempted a deep pass (20-plus yards) on 19.9 percent of his throws (second highest) and connected for a total of 1,324 yards in the second quarter despite being subjected to 10 dropped passes. 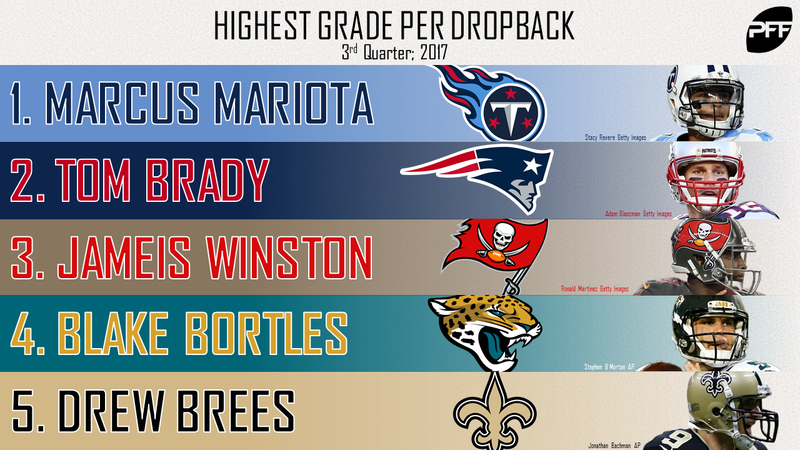 Marcus Mariota dominated the third quarter on a per-dropback grade basis, tossing 10 big-time throws compared to just one turnover-worthy throw in the quarter. Mariota’s 9.4 percent big-time throw percentage was the second-highest among quarterbacks while his adjusted passer rating of 119.1 was clearly the highest in the league. Mariota seemed comfortable both against pressure, when blitzed and when kept clean in the pocket, fielding passer ratings within top 14 in all three categories. He whipped the ball around to the tune of a 78.7 percent adjusted completion percentage, which ranked him sixth in the quarter. Once again, Brady finds himself in the top five, only this time finds himself without Ryan in the top five. Brady averaged a depth of target of 10.11 yards in the third quarter but saw 10 of his passes dropped, still fielding an adjusted completion percentage of 79.2 percent, which was good enough for fifth in the league. Perhaps coming as a shock, Blake Bortles finished as the fourth-highest quarterback in the league on a per-dropback grade in the third quarter, throwing 11 big-time throws against just three turnover-worthy throws. All told, he threw the league’s highest big-time throw percentage in the third quarter. 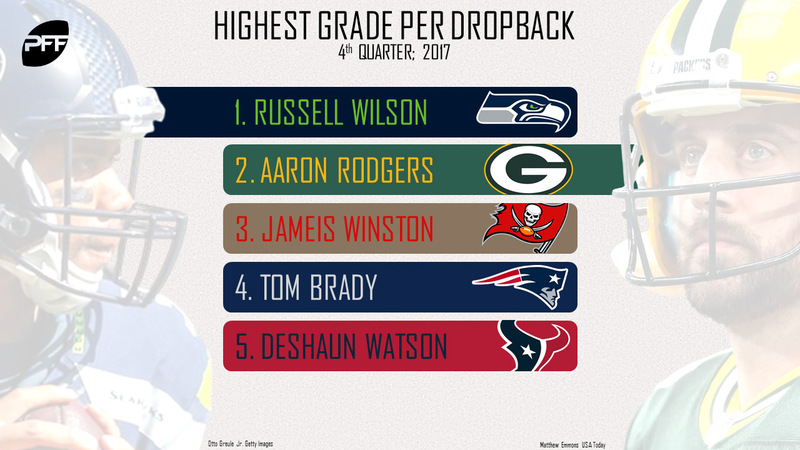 While it was mentioned earlier, Wilson finds himself in sole possession of the highest mark in terms of highest grade-per-dropback in the fourth quarter. His crunch time prowess was evident as he launched 13 big-time throws in the game’s final frame, two more than Brady (11) who finished second. His 120.3 adjusted passer rating was 7.0 points clear of second place, and the highest of any quarterback through any quarter in 2017. His ridiculous 77.7 percent adjusted completion percentage ranked fifth despite seeing an astounding average depth of target (aDOT) of 12.15 yards, the third-highest aDOT of any quarterback in any quarter last season. 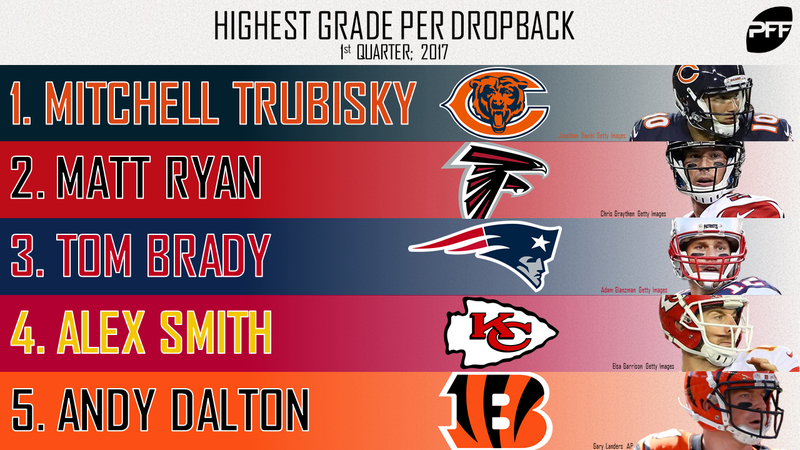 No surprise here, Brady once again finds himself in the top five in terms of grade-per-dropback in a single quarter, finishing as the only NFL quarterback to rank within the top five in every quarter. Aaron Rodgers had great success in the final quarter in his limited time in 2017, finishing with the second-highest adjusted completion percentage (82.3 percent) and a 7-0 touchdown-to-interception ratio. He was particularly great when kept clean, finishing with a 133.2 passer rating, the second-highest behind only Wilson in the fourth quarter.